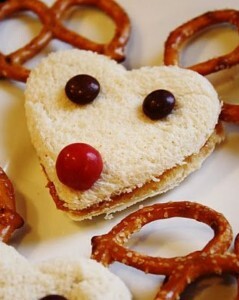 Imagine you son or daughter’s face when they open their lunch box and find a reindeer pb&j? You will definitely be “super mom” that day. I have heart shape cutters. If you don’t you can just cut the sandwich in half and use one triangle to make the face. If you want to get a heart cutter they sell them for $1.99 on the bread isle at most supermarkets. I don’t have to tell you how to make a pb&j. Just add pretzels (the original shape pretzel is the one you need for this sandwich), 2 brown m&m’s to make the eyes and a Cherry or even another red m&m to make the nose. Thank you so much! Keep following!